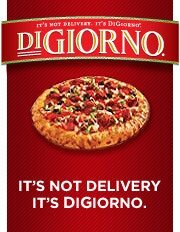 I wanted to tell you about the DiGiorno Countdown to Greatness Sweepstakes on Facebook. The sweeps is a great opportunity to win some awesome prizes! Only a few more days left to enter for your chance to win a 65" TV, $5,000 in cash, a surround-sound package, a stainless steel fridge and free DIGIORNO® Pizza for a year. Now, get in there and enter for a chance to win before it's too late, the sweepstake ends at 11:59 PM 1/28!